For Tokyo, Subaru's revealed the WRX STI Carbon. It takes the Subaru WRX STI, replaces the regular roof with carbon fiber, adds suede seats to enhance "driving excitement" and comes with the JDM-spec automatic transmission. 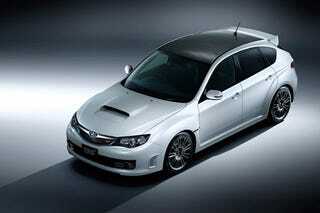 We understand the decision to further lower the weight of the WRX STI, so we guess the carbon fiber roof makes sense. But we don't have the slightest idea why Subaru would decide to then boost said weight savings with suede seats — something we don't think really "enhances driving excitement." Sort of like the JDM-only automatic transmission. Puh-lease Subaru, do not be bringin' this here, kay?